REMNANTS REBORN"Red Maverick" Pet Blanket - Every purchase ships a box of blankets to an animal shelter! Comfort for Critters was formed as a nonprofit in 2007, with a mission to create handmade blankets which are given, free of charge, to animal shelters across the US. These simple blankets provide comfort to the homeless pets in the shelter, and then help ease their transition into their forever home when they are adopted. We've been creating these blankets for over 10 years now, and have shipped over 55,000 blankets, so we know they do make a difference to shelters, the adoptive families and shelter pets. After making these blankets we often have a bit left over, and never wanting to waste, Remnants Reborn was created. All Remnants Reborn blankets are made exclusively by Linda Kastiel Kozlowski (our founder), sold on Etsy and Amazon, and raise funds to keep CFC going and to ship our blankets to over 200 US shelters (in every state!). When you purchase this blanket, you are providing funds for us to ship a big box of 15-20 handmade blankets to an animal shelter in need. We ship 1,000+ blankets free of charge to animal shelters every month, so funds are desperately needed! Since they use the same yarn, Remnants Reborn blankets follow the same guidelines as all our blankets. We use super soft, thick and washable yarn. We also make them colorful and fun! Every blanket is completely handmade and truly one-of-a-kind! 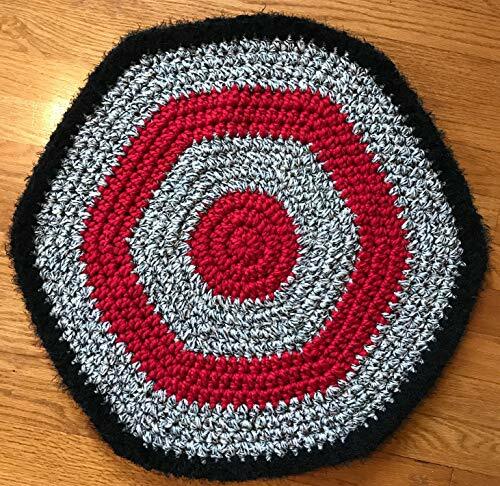 This 23" across "Red Maverick" blanket is for any kitty or companion that loves softness and comfort. The colors are like royalty, in a rich ruby red, jet black and then a wonderfully-variegated yarn that sprinkles in a variety of colors! It's all trimmed in a dark black "Fun Fur! As your pet enjoys this blanket you'll know that shelter pets are enjoying their free handmade blankets because of your purchase!! If you have any questions about this product by Comfort for Critters, contact us by completing and submitting the form below. If you are looking for a specif part number, please include it with your message.